As an introvert (who does a good impression of an extrovert), the solitary nature of running appeals to me. But even introverts, and solitary runners, can benefit from company and sometimes they even enjoy it. 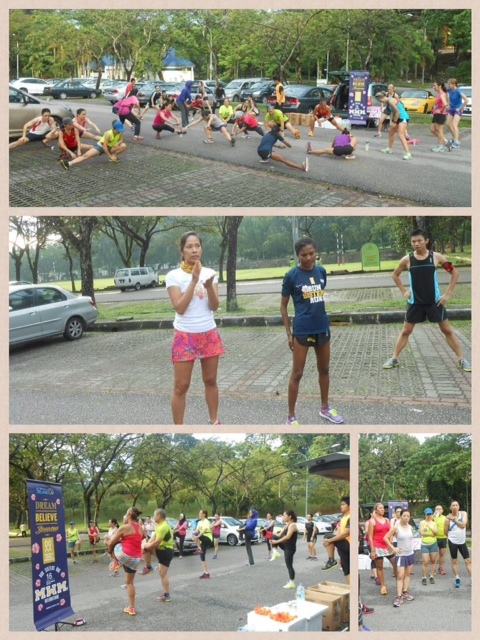 Such was the case yesterday at the Malaysia Women Marathon training session, the second in a series of running clinics organised by MWM Race Director Karen Loh in the lead-up to the 10km, 21km, and 42km MWM races on March 16th in Shah Alam. The meeting point yesterday was Padang Merbok. This is the start and finish location of a number of popular races including the upcoming MPIB 12 km on January 5th. It’s reasonable to expect a car park to be deserted at 6 AM on the last Sunday before Christmas but this place was a hubbub of activity in the dark as runners gathered to embark on their LSDs in the relative cool early morning air. I know – only people who live in the Tropics consider 24 degrees Celsius and 100% humidity to be cool! 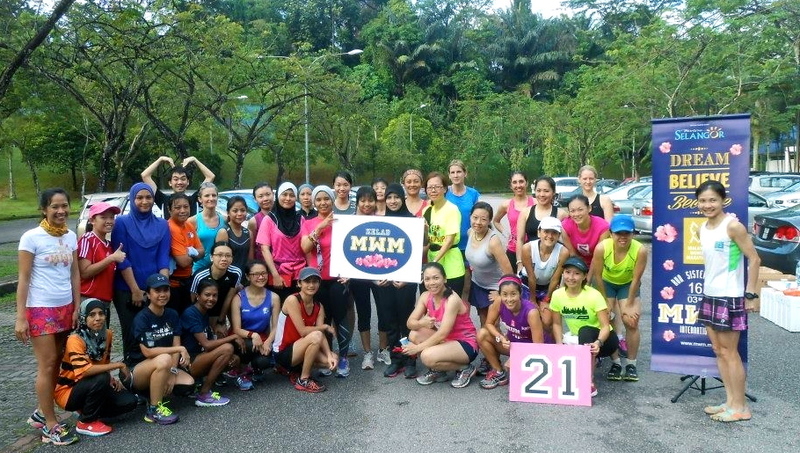 Race Director Karen, accompanied by the MWM half marathon mentors, Lorna Wong and Sheela Samivellu, explained that the running session would consist of two 6 km loops along the hilly – very hilly – terrain of Bukit Tunku. For any ladies who had signed up for the MPIB race, this was a great opportunity to check out some of the route. Hilly route! Two loops added up to 13.5km on my watch. After our warm-up, around 20 ladies and our mentors, took off. We did the first loop, which turned out to be almost 7 km, slow and steady, passing and greeting many other runners en route. Each runner ran at a pace they found comfortable so we ended up breaking into small groups. It was nice to chat and run, and as always happens when I run with company, I marvelled at how much easier it is, than running alone. Just like life I guess. After refreshments – water, isotonic drinks, mandarin oranges and apples, kindly provided by Karen – we set off a second time, with instructions to try the route at a higher pace. I was a little faster than the leading group and was very fortunate, though somewhat apprehensive, when Sheela, MWM mentor and local champion runner, accompanied me up a hill and started to pace me. We ran the rest, around 4km, of the route together and no kidding it was the fastest I’ve run for anything over 1km – ever. If it had been a race, I’d have slowed or even stopped, but because I was running with Sheela I didn’t want to humiliate myself by showing weakness. There were several lessons learned there, not only about the undiscovered power and speed in my legs, but more importantly I suspect, the importance of the mind in pushing through discomfort in the search for glory (or just a sense of achievement which feels glorious). Post-run stretching and mentoring session. Back at the car park, Karen once again doled out refreshments, before the group gathered to chat, take photos and do a Q&A session with the mentors. Interval workouts and tempo runs were discussed, before I jokingly, but really quite seriously, enquired if the MWM ladies could meet up and run together every week. 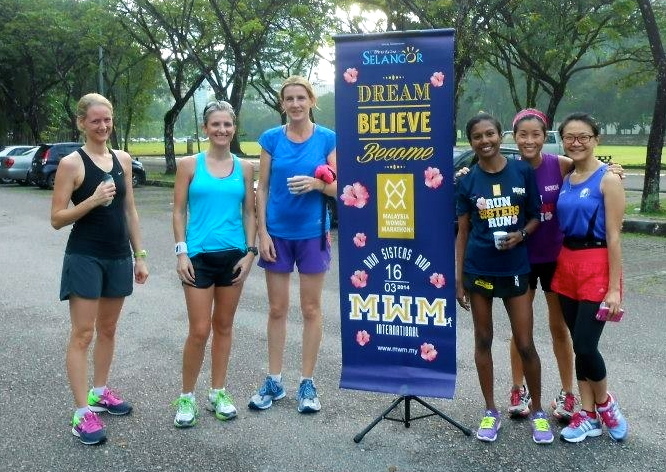 Karen informed us that there are plans in place to set up an MWM runners club. As soon as more details are available, I will of course post them here. There were many different levels of runners at yesterday’s session. For some it was about pushing themselves up hills, resisting the urge to slow to a walk; for me it was about pushing past my fear of running fast. Irrespective of what our individual ambitions or self-imposed limitations were, every single person at the clinic had three things in common: each one of us was Dreaming, Believing, and Becoming. That’s what MWM is about. 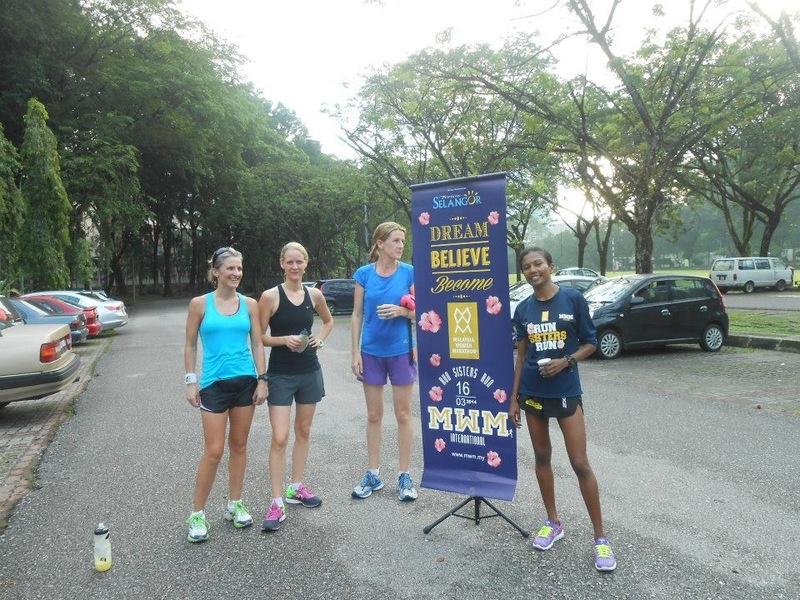 To register for the Malaysia Women Marathon click here. 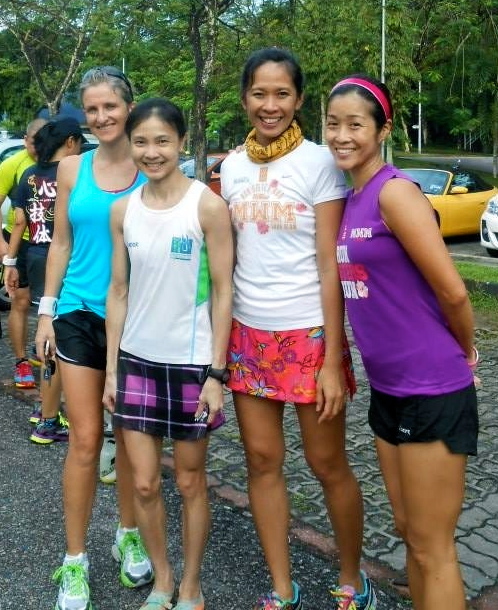 Sheela, Half Marathon mentor, champion runner and my personal hero yesterday, is third from the right. Thank you to Karen Loh for most of the photos shown in this post. 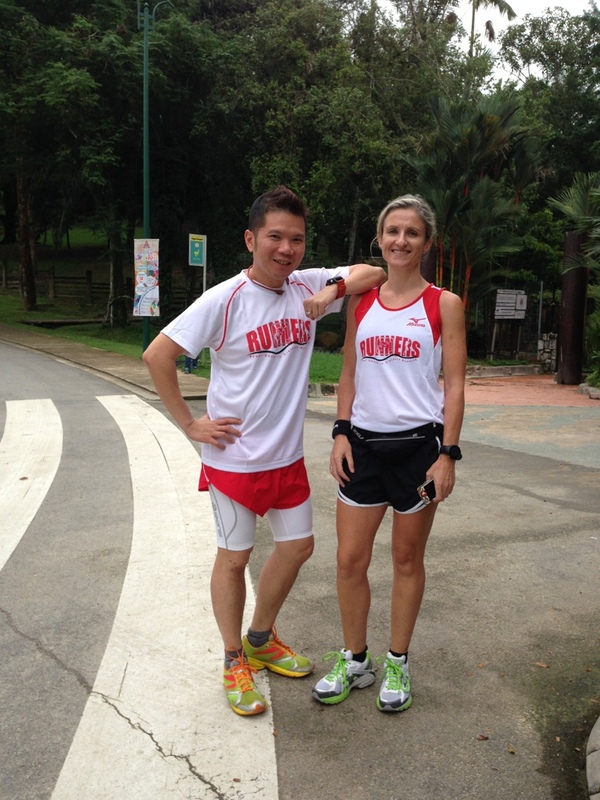 My running club’s new kit – a very impromptu modelling session with my friend KK on Wednesday night. The kit came with red Mizuno shorts but the shorts are, well,a bit too short! Running after injury feels a bit like life in general – it has its ups and downs. I recovered well from the 2XU Compression 15km run and would have had a great training week last week if it hadn’t been for a sore throat and sinus infection. Although I had to miss my running club’s Fartlek training on Wednesday night, I was almost back to my usual mileage by Sunday. 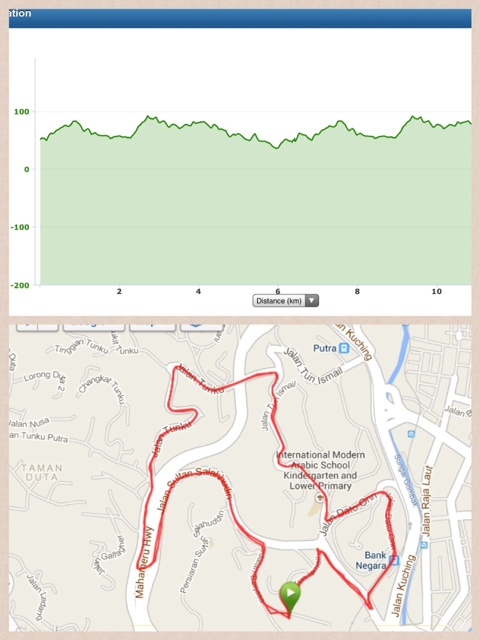 I ran 18km on a very hilly route on Saturday morning which felt fine but afterwards my foot complained. A lot. When I woke up Sunday morning, it was ever more sore, the sorest it has been since the original injury, so I knew that the sensible thing was to drop any running plans for the day. I was worried, wondering if I was looking at a future of 10km races (if I was lucky). Reading horror stories online of people needing to take six months off because of PTT injuries did little to quell the fear in my gut. Once again, Akmal, my physiotherapist, came to the rescue. It’s alright, lah, he says. It’s normal lah. After doing some heavy massage and stretching on the foot and ankle on Monday, he ordered me to run 15km yesterday. Really?! Yes, really. I only did 10km as it was stinking hot, the battery on my Garmin died – and what’s the point of running a kilometre that can’t be recorded for posterity, right?! – and I’m still sniffling and coughing. These are my three excuses for when I see Akmal today. The foot still aches but he assures me that this is caused by stiffness in my ankle joint, something that will take time and work to sort. The good news is that part of the work involves running. Tonight, coughing or not, I plan to return yet again to my running cub to do 8 x 500 m acceleration reps. It won’t be pretty but as I feel the ‘delight’ that is my lactic threshold, I will try and remind myself how grateful I am to be there.